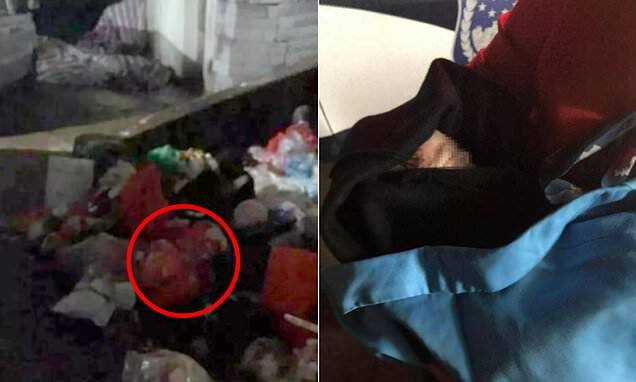 A newborn baby has been saved after being abandoned in a rubbish dump with her umbilical cord still attached in southern China. The baby, a girl, was found wrapped in a red plastic bag by a passerby who went to chuck garbage. The passerby heard cries from the waste and initially thought it was a kitten. After searching through a pile of rubbish with a torch, she was shocked to find a baby. Police are currently looking for the baby's parents. The incident took place on Sunday night in the city of Foshan in Guangdong Province, according to the police. The girl was found in the rubbish dump next to a park in the city's Ronggui area, the police said in an online statement.